A Thing for Roses: We Have a Winner! I am overwhelmed by all the wonderful comments left on my 200th post giveaway post. I thoroughly enjoyed reading each and every one. Thank you all for your kind words of support and encouragement. I want to send a special thanks to everyone who promoted my giveaway on their blogs. I know everyone says this, but I really do wish I could give you all something special. The winner is Patricia from Vintage Linen Treasures! Patricia, please email me with your address so I can get your pillow in the mail to you pronto. Yesterday, Isabel and I had fun at the flea market. We ran into Joy, Martha and Diane, who incidentally, just started her new blog. I say, "it's about time!" Diane has the most wonderful home and does sales in a fabulous barn on her property. I blogged about it a long time ago which you can see here. Diane is a real sweetheart and has an amazing eye for finding the coolest vintage stuff. I never leave one of her sales without finding an amazing treasure or two. So, stop by her new blog to say hi and give her a big blogland welcome. She would love it! Anyway, I only found a few treasures at the flea market so I decided to hit a couple thrift stores as well. Here's a picture of the goodies I got. As you can see, all little stuff which is just fine by me. I fell in love with this chippy aqua doll house chair and sofa the minute I laid eyes on it. 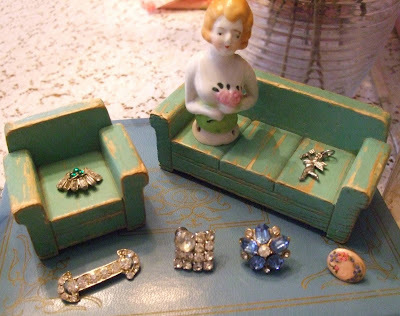 Lots of great rhinestone trinkets for a project I have been planning for ages. Hopefully I will get it done by Farm Chicks. My husband was thrilled that I didn't bring anything big home. Well, this week will be spent working on getting my house cleaned up and start getting things organized for Farm Chicks. June will be here before I know it and I have a ton of painting, sewing, fixing to do before then. Have a great week everyone! I hope to be back soon with a few projects to show you. Lookie there! I never find frogs! 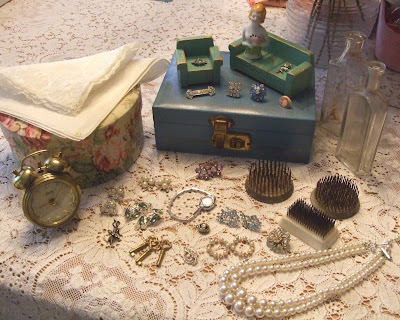 What great treasures you found, and yes my husband would be happy with "small" treasures. Havea great Week! OMGosh! Love all the blingy treasures!! Your recent finds are just amazing. My mouth is watering over the tiny aqua chair and sofa! And all that shiny, happy stuff..Well done! Love it all, especially the little furniture! Have you seen my little pink set? I'll take a pic for ya. Wow!!! What wonderful treasure's you found. 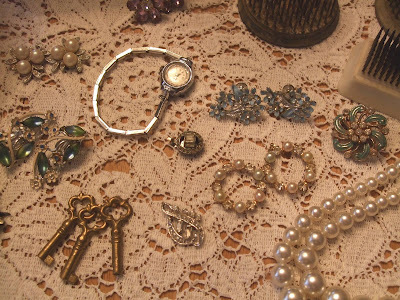 Love the vintage jewlery. hi there Lisa! You have found some great stuff & there can never be to much "smalls" in a sale! I like your finds, especially the doll & the keys. Flea markets are such fun! Loving all of your vintage finds! I just booked my ticket for the Farm Chicks this weekend, can't wait to see you there!!! What a fun beautiful blog you have. From wrapping paper boxes, daughter's first bf, barkcloth finds, his and her pillowcases, shoveling snow for the first time, walk on the beach and so on... I've read so many I can't list them all. I'll be back and thanks for having me. Wow great finds, cant wait for the weekend so I can go treasure hunting too! !